Read it! Trace it! Paste it! 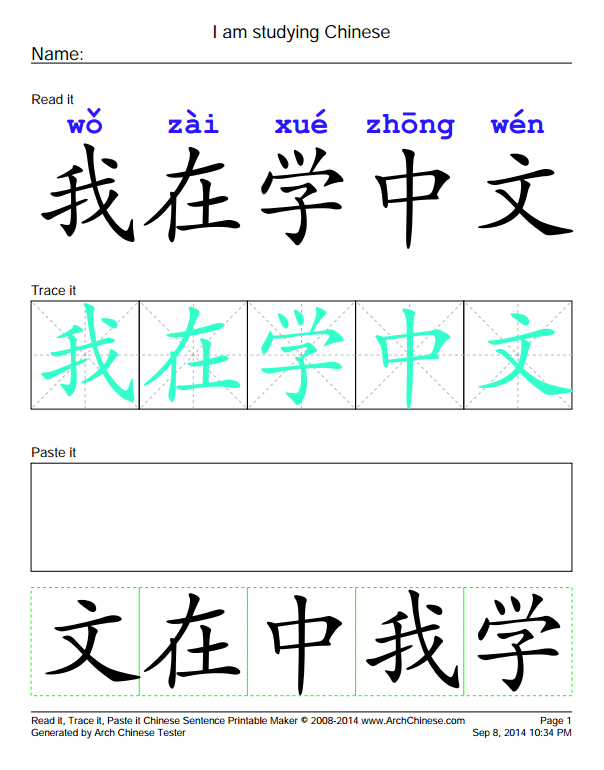 This innovative tool allows the Chinese language teachers and home-school parents to create great worksheets for practicing simple Chinese sentences with common words. They are perfect for young Chinese learners. "Read it, Trace it and Paste it" is a fun and effective way for young kids to learn common Chinese characters and Chinese sentence structure. It can also strengthen the fine-motor skills of the young learners. 1. For Pinyin, tone number notation must be used. Use v for ü and the number 5 for the neutral tone. There is a blank space between two syllables. The system automatically converts the tone numbers to tone marks on the generated worksheets. 2. Font size and page orientation will be adjusted automatically.